The Children's Book Council of Australia have announced The 2009 Book Of the Year Award Winners. The were 6 titles shorltisted in each of the 5 categories. Each category has a winner and two honour titles. A collection of short stories that use Shaun's trademark illustrative style to increase meaning and enjoyment. The third book in the Kingdom of Silk series. Perry Angel arrives at the Kingdom of Silk clinging to his old battered suitcase. A beautifully written and sensitive story. In a cool, grey, unfeeling city Will is the only person to notice a fallen bird. Follow him as he cares for the bird. Olive's mother and aunty are traditional basket weavers in the Northern Territory. In this story she and her friend Rose learn about the roots and berries used as dyes in the process. In 2006, an Australian mountaineer was left for dead in the 'death zone' following a successful ascent of Mount Everest. A great account by him of his survival and the perils of such an extreme adventure. 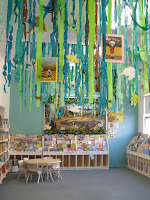 Cronulla Library will close its current location on Monday 21 September 2009, while it is relocated to a bigger and brighter space in the new Cronulla Central. The doors will close for last time after 40 years at Surf Road on Saturday 19 September. This will be your last opportunity to borrow or return books and/or collect holds from Cronulla Library in its current location. The new Library will open for business in Cronulla Central (entry from Cronulla Plaza or Croydon Street) on Monday 19 October. During the closure Cronulla Library will not be accepting returns. Any items being held for you will need to be collected from Caringbah Library. We look forward to seeing you all in our fresh new space in October but during the closure all enquiries should be directed to Sutherland Library. We are sorry for the inconvenience this may cause. Thank you to the Knitters of the Sutherland Shire! You have donated, 56 completed rugs and 660 squares, (enough to make another 23 rugs) for the Wrap with Love project via your Library service and many, many more through the Stapleton Avenue Community Centre. The variety, colour and creativeness of the squares & rugs brought pleasure to all who saw them displayed. One can only imagine the comfort, delight and sense of being valued that receiving any one of these rugs would provide a recipient. They are all being collected now and sent into the Sydney Warehouse for distribution through over forty non-denominational and non-political aid agencies world wide. Last year 27372 rugs were given out, throughout 34 countries. Knitters got together at both Caringbah and Sutherland Libraries where they felt part of the wider Sydney event, with live streaming of 2BL coverage, of the "Knit in", as well as webcam vision of the ‘skeins’ (?) of knitters crammed into the foyer of the the ABC studio in Ultimo. 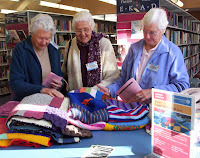 Now Sutherland Libraries are in on the Wrap with Love Knit in experience, we are hoping for bigger crowds each year, so keep us in mind as a knitting venue for 2010. Sutherland Library will be hosting a talk by Greg de Moore on one of our first sporting heroes. Join us to hear the story behind the book, Tom Wills: his spectacular rise and tragic fall. As well as a facinating story of Australian and family history, sport and biography the author's talk will provide insight into the discovery of a wealth of historical documents. Tom Wills was the man most often credited with creating the game that we now know as Australian Rules football. Tom was sent to the strict British Rugby School in 1850 and returned a talented cricketer. Tom's life was changed forever after he returned home to the Queensland outback where his father was murdered in the biggest massacre of Europeans by Aboriginals. Five years later, Tom went on to coach the first Aboriginal cricket team. As Tom's physical talent's began to fade, he descended into a different world. Greg De Moore's historical biography of Tom Wills is the product of ten years of research. This research unearthed original medical records, letters, text books and notes previously believed to have been lost or destroyed. Tom Wills' story goes beyond sport to become important social history. Come and listen to this intriguing family history, which is also an important but little known part of Australian colonial history. You may even pick up a few tips on researching your own family history! For further information and contact details see our Events Calendar. If you are looking for excellent advice from HSC experts in preparation for your HSC exams on English, Ancient History or Modern History, then don't miss the next series of HSC lectures @ Sutherland Library. On Wednesday 2 September, 6.30-8pm Larry Grumley, English head teacher, study guide author and HSC senior marker, with over 25 years experience, will share his expertise on answering the HSC English paper 1- Area of Study, Belonging. A limited number of Larry’s workbooks will be available for purchase for $15. Bruce Dennett, HSC Lecturer, co-author of the Modern History curriculum, award winning History teacher, and author of study guides and textbooks for Ancient and Modern History, as well as an HSC marker, will present two history lectures. The first is on the Ancient History core topic of Cities of Vesuvius - Pompeii and Herculaneum, which is on Wednesday 9 September, 6.30-8pm. The second lecture by Bruce Dennett, is on Wednesday 16 September, 6.30-8pm and will be on the Modern History core topic World War 1, 1914-1919. Bruce is a dynamic speaker with a wealth of knowledge and invaluable tips for students. Students shouldn't miss this great opportunity to gain knowledge and insights on how to approach the HSC exam questions in the most effective way. All lectures are held in the Southern Lounge at Sutherland Library and tickets for each lecture are $5. Bookings are essential as places are limited. Please phone 9710 0351 to book or ask at any Sutherland Shire Library.